At its most basic, food is vital to our survival there can be no form of life without it. But in economically developed and thriving societies there is more to eating and drinking than just surviving. As the centuries have passed, the marketing, preparation and presentation of food has become an intrinsic part of the modern consumer society. Food operates in the religious sphere too, with consumption and abstinence playing their part in religious ritual whilst methods of animal slaughter have moved into the political, as well as the religious arena. Food not only sustains the migrant on both the real and metaphorical journey from home to elsewhere, it also provides a bridge between the familiar and the unfamiliar. Food acts as a catalyst for cultural fusion and excitement but it can also endanger: change of diet all too frequently creating as many health problems as it resolves. Its multi-disciplinary nature enables Food in the Migrant Experience to address all the above issues in chapters written by leading academics in the fields of migration, economics, nutrition, medicine and history. As we continue to explore the minutiae of the immigrant experience, this book will be essential reading to all those engaged in the study of migration. 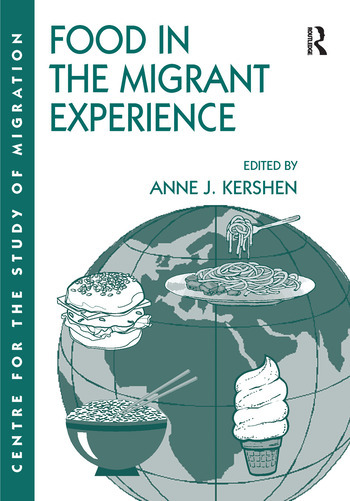 Contents: Introduction: food in the migrant experience, Anne J. Kershen. Food in Migrant History: Italian penny ice-men in Victoria London, Lucio Sponza; The spicing up of English provincial life: the history of curry in Leicester, Panikos Panayi; Practices of a low anthropologic level: a Shehitah controversy of the 1950s, Todd Endelman. Migrants, Food and Entrepreneurship: Dutch and their beer brewing in England 1400-1700, Lien Bich Luu; Transported food: convict food habits in Australia, Bruce Hindmarsh; Immigrant entrepreneurs in the food sector: breaking the mould, Anuradha Basu; Sweet and sour - the Chinese experience of food, Sally Chan. Food and the Health of Immigrants: Equal access to healthy food for ethnic minorities?, Angela J.M. Donkin, and Elizabeth A. Dowler; Assessing food insecurity and nutritional well-being of preschool refugee children in the UK, Daniel W. Sellen and Alison Tedstone; The Bangladeshi diaspora and its dietary profile in East London 1990-2000, Nasima Mannan and Barbara J. Boucher; Index.